From Calf to Heifer takes the reader through the basics of successful rearing and how to control risks. It helps to show how to structure the rearing process so that each calf automatically receives the best treatment. This book is clearly written and full of sensible tips on how to improve the rearing of calves and yearlings. Numerous photographs and Marleen Felius's splendid drawings also make this informative handbook very pracrical and user-friendly Rearing calves into heifers is a major investment in terms of money and labour. Your dual aims are to turn your heifer into a strong, productive dairy cow and to use labour, housing and feed efficiently. If you achieve these aims, you'll cut the costs of rearing per kilogram of milk. 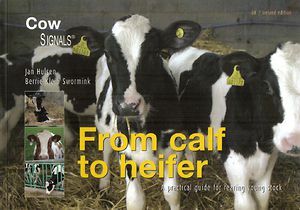 From calf to heifer covers the basics of successful rearing, shows you how to control risks and helps you to structure your work so that each calf automatically receives the best treatment. From calf to heifer is full of sensible tips on how to improve the rearing of calves and yearlings. Written clearly and illustrated with useful photos and Marleen Felius's splendid drawings, this informative handbook is very user-friendly and down to earth.